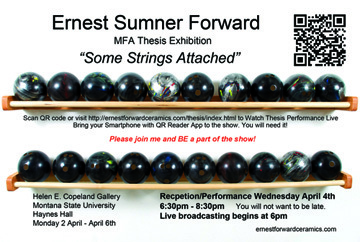 Montana State University School of Art and the Helen E. Copeland Gallery invite the public to the premiere of “Some Strings Attached”, an MFA thesis exhibition by artist Ernest Forward. Forward’s thesis exhibition includes a body of work installed to create the environment as a “Haptiacle” created for the completion of Mr. Forward’s degree of Master of Fine Arts at Montana State University – Bozeman. This Haptiacle is the first of its kind, never performed before until now. This is the new Americana approach of ceramics, art, and the exhibition space. After the installation of this show the artist has relinquished the control to the viewers for a full Haptiacle experience with the complete elimination of the confinement of the gallery walls. This show exists in every place that has access to the Internet and is fully accessible to all around the world to provide an abundance of memories and to provoke the imagination. It is the artist’s intent to raise awareness of ritual involving the handling, breaking and performance aspect of ceramic objects. 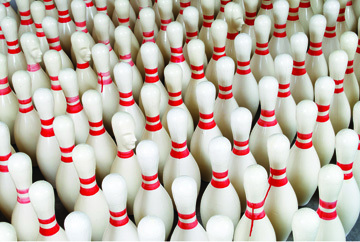 The exhibition dates are Monday April 2 – Friday April 6, 2012, and it is free and open to the public. There will be an opening reception and performance on Wednesday April 6 from 6:30 – 8:30 PM. The Helen E. Copeland Gallery is located within The School of Art’s Haynes Hall, on the second floor and is open Monday through Friday, 9:00AM – 5:00PM.